At Blackthorn & Brook we arrange luxury riding and foxhunting vacations. We take pride in matching you to the right animal. Nothing is more important than your safety and comfort. Whether you're a first flight foxhunter or a weekend trail rider, a mannerly, suitable horse awaits you in England. Similarly, each ride or hunt is chosen carefully to get the balance between excitement and enjoyment. These are riding vacations that you won't find in the guide book. Throughout your trip you'll be looked after by Megan who has lived in this part of the world all her life. Under her enthusiastic guidance you will be personally introduced to this corner of Great Britain, its unforgettable landscapes and its welcoming people. With Blackthorn & Brook you can rest assured that every leg of your journey will be smooth and stress-free. But on top of that, we're really proud of the little details that make a vacation really special. From your favourite tipple in your flask to beautiful mementos of your trip, prepare to be delighted by the little touches. "I have had such an amazing time out hunting, meeting new people and exploring your beautiful country. All of the horses were amazing and took such good care of me. I also really appreciated Megan's helpful tips out hunting." "When going on a riding trip, there is usually something not quite right, such as bad lodgings, naughty horses, or disappointing food. Not on this luxurious trip. It was perfect. Blackthorn and Brook, you know how to make a holiday 1st class!" "The horses were a treat. They were beautifully trained and well behaved. They gave us the courage to try our first hedges. What a blast! You only live once and I'm truly glad we have this week to hold on to. It was the vacation of a lifetime"
Your trip to the UK doesn't have to all be about riding. There are lots of exciting and unusual things to do here out of the saddle. For a truly luxurious experience how about a flight over hunt-country in an open-cockpit plane or a day behind the wheel of an Aston Martin? 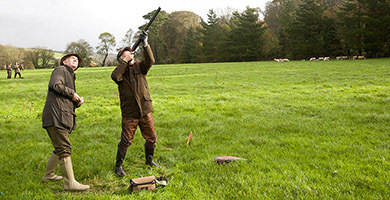 We also offer shooting on a superb country estate in Cornwall. Megan is passionate about the area. She can personally accompany you on historical tours of our local towns and cities such as Bath and Salisbury, arrange interesting walks on the Dorset Coast, a World Heritage Site, and take you to meet the staff at hunt kennels. For many of our guests the luxury is simply the chance to meet lots of real hunting people. We are located in a very special part of the UK, on the borders of Somerset, Dorset and Wiltshire we're spoilt with our hunting and riding. A range of fashionable and contrasting packs are all within easy reach for a day trip. 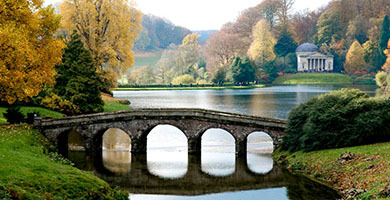 A classical landscape of lakes, woodland and picturesque villages, one of our favourite places for a long ride and a picnic is the stunning Stourhead Estate. Equally close are Cranborne Chase, the Blackdown Hills and the Mendips: all exquisite landscapes to cross on horse-back. Further afield (but still within reach for a day trip) are the Dorset and Devon coastlines and the New Forest. These unspoilt and atmospheric parts of Great Britain are waiting to be explored by horse or on foot.